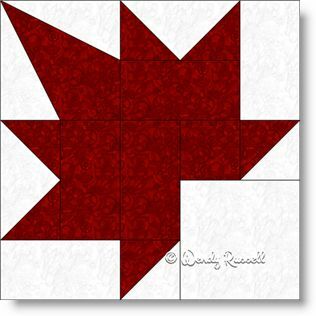 This Maple Leaf quilt block is for those quilters who do not mind creating a patch by using a template to cut a few of the pieces. There is nothing difficult about that, but it allows for making a quilt block that you might feel is a little more interesting than the standard Maple Leaf block. The latter is a good choice for a beginner quilter. Having said all that, I really liked how this block turned out, and by throwing in an extra colour choice, the final sample quilts illustrated have a little more "pizzazz" (in my opinion). You can come up with all sorts of interesting quilt layouts by simply rotating the blocks in different locations in your quilt. Another choice you might make is to use a variety of colours in the "leaf", such as those we see on the changing leaves in the fall season for some really interesting quilt blocks.